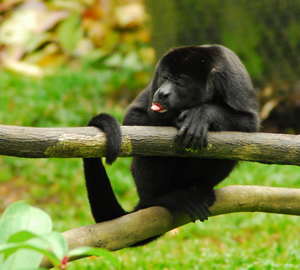 The Osa Wildlife Sanctuary is contiguous with Piedras Blancas National Park, meaning we see many of the parks' animals on our grounds, and our released animals make the park their home. This is just a small selection of the high biodiversity of the park and some of the animals we have rescued at the sanctuary! National Geographic has coined the Osa Peninsula "the most biologically intense place on earth" with over 300 endemic species of plants and vertebrates, the largest population of scarlet macaws in Central America, and 140 mammal species (including 25 species of dolphins and whales)! The Osa sustains 2.5% of the world biodiversity alone, drawing in wildlife lovers from around the world. 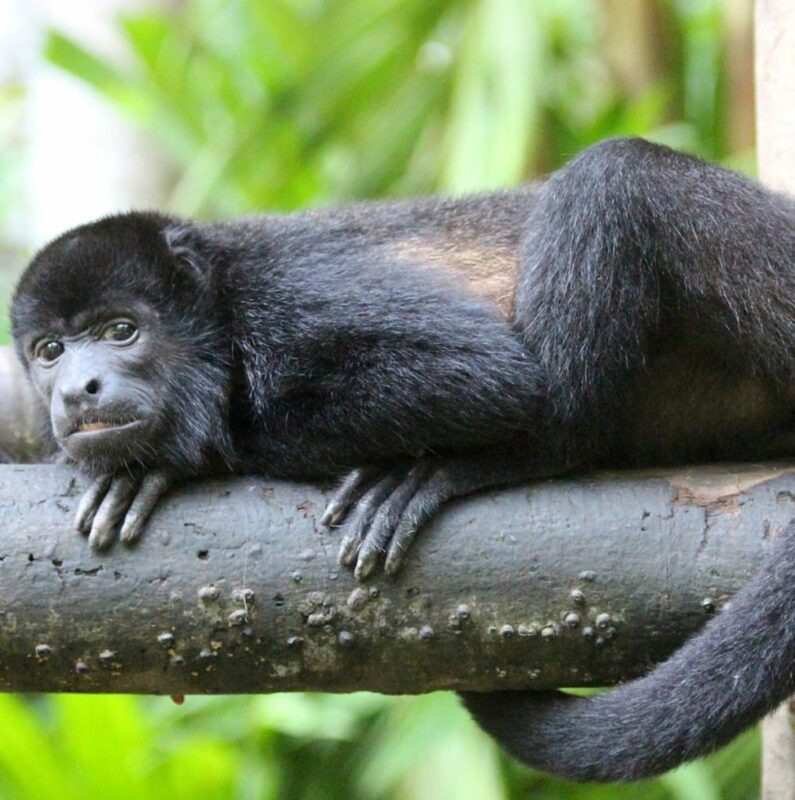 Just across the bay from our sanctuary is Corcovado National Park, known for its amazing variability of ecosystems and hikes that give you the opportunity to spot some of the most elusive wildlife Costa Rica has to offer, such as squirrel monkeys and jaguars. This variability in ecosystems and wildlife extends to our own Piedras Blancas National Park, with which our sanctuary is contiguous. 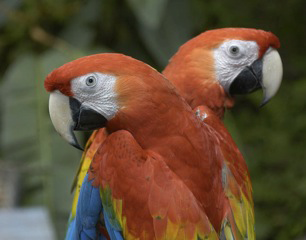 The Osa as a whole holds the Costa Rica's largest population of scarlet macaws, and the socially monogamous species can be seen flying in pairs high in the skies. The amazing wildlife isn't just land-locked either: humpback whales, whale sharks, dolphins, and even orcas have been spotted in the gulf between Corcovado and Piedras Blancas, skimming the water and checking out any one of the boats carrying people from one place to the next. 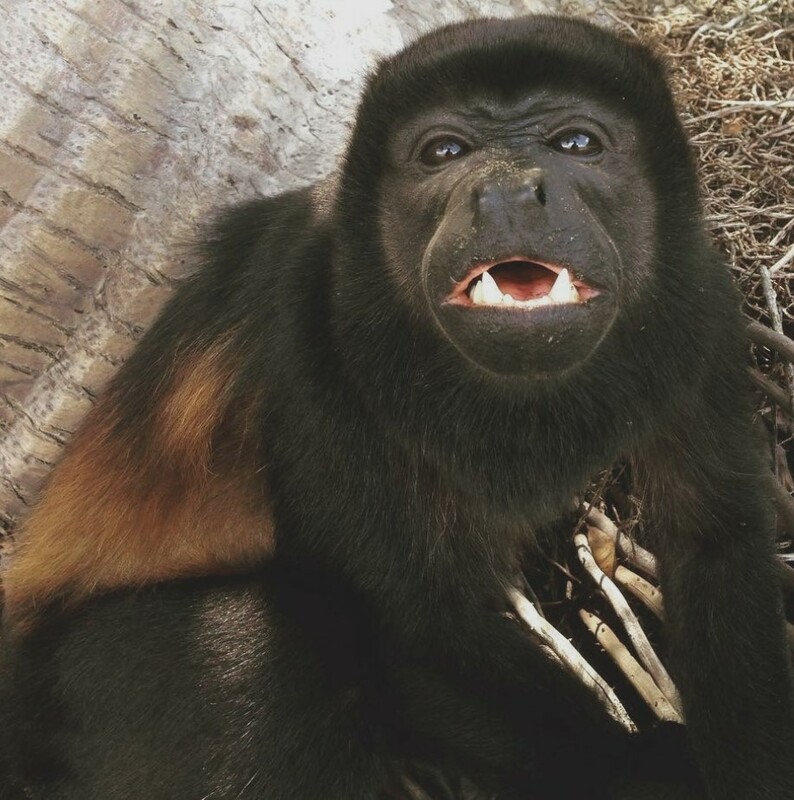 One of the highlights of a first visit to Central or South America is the intimidatingly loud roar of howler monkey troops at dawn and dusk. Roars can last up to 10 seconds and the sound can carry for many miles. Their name refers to their roar and the yellow/reddish fur on the back and sides. Howlers forage during the day and often start before dawn. They are diurnal and spend their nights sleeping in canopy branches. They have a distinctive beard of fur on chin hiding the Hyoid bone next to the vocal chords. This bone serves as an amplifier for the Howler’s roar. 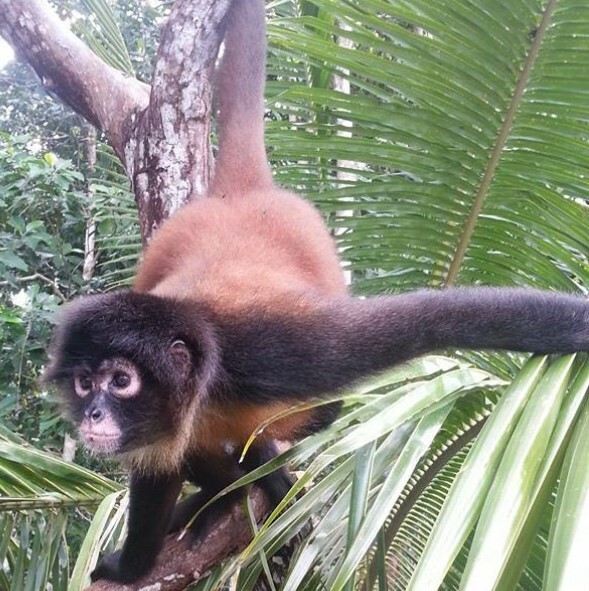 They have a prehensile tail and move through the canopy more slowly than spider monkeys. Their low-energy diet rich in leaves makes digestion a slow process. Females are sexually mature in 3-4 years and will leave their birth troop and integrate with a nearby troop. 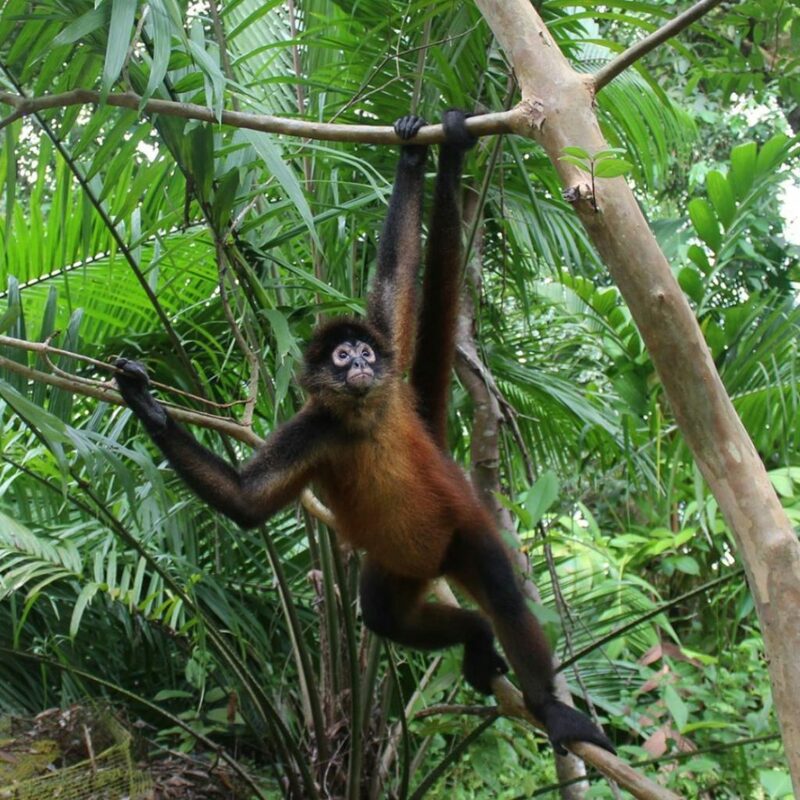 Spider monkeys are diurnal and arboreal, living in loose troops. 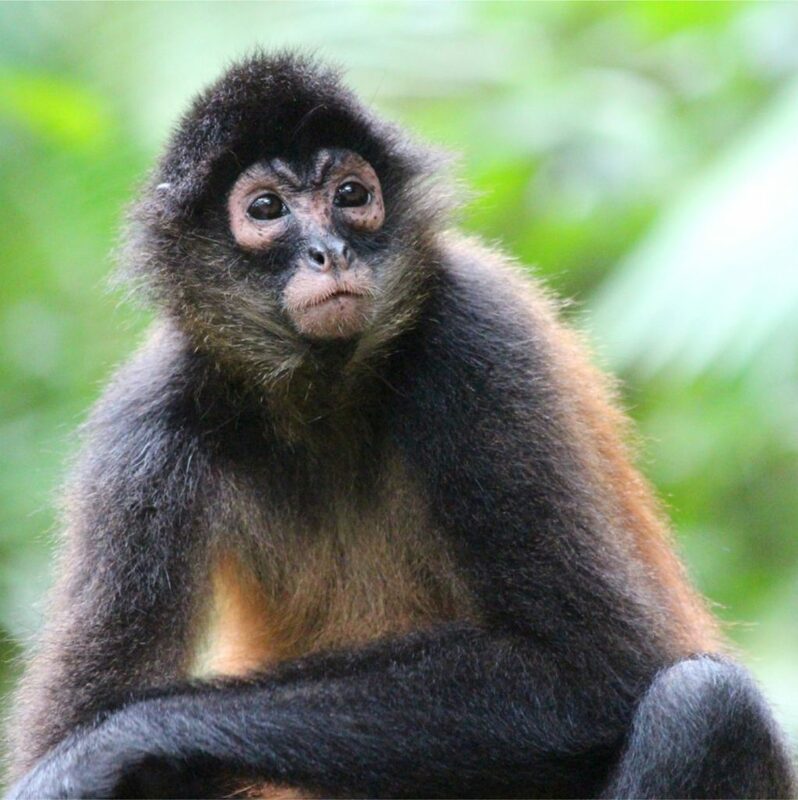 Spider monkeys are more exclusively fruit-eaters than other Costa Rican monkeys. This reliance on fruit makes them vulnerable to the effects of land clearing and forest fragmentation. The adults have a distinct light-colored mask of bare skin around eyes and mouth. They have the strongest prehensile tail in the mammal kingdom with a patch of skin near the tip of the tail that allows them to more firmly grip branches. This combined with long, strong fingers that allow them to “brachiate” – swing limb to limb. Females reach sexual maturity in about 4 years. The females leave the troop when they sexually mature and join another troop. Their small size and lack of prehensile tail distinguish the squirrel monkey from other monkeys. They forage mostly for insects in the lower forest canopy. The females remain with their birth troop and the males change troops. There is an interesting geographic gap between the Costa Rican and the South American populations that as caused some to speculate that humans may have introduced squirrel monkeys to Costa Rica. 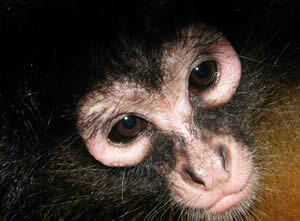 Capuchins are diurnal and mostly arboreal. They have a distinct pinkish, naked face and black cap on top of their head. 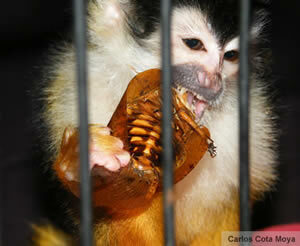 Capuchins are considered the most intelligent of the new world monkeys. They are omnivores, eating fruits, leaves, flowers, insects and small animals. Individuals remain with their birth troop their entire life. Troops are very antagonistic to non-troop members. They are also used as service animals, sometimes being called "nature's butlers." 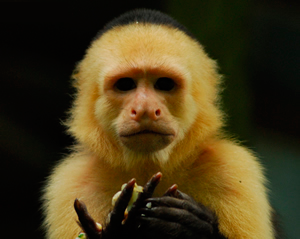 Some organizations have been training capuchin monkeys to assist quadriplegics as monkey helpers in a manner similar to mobility assistance dogs. After being socialized in a human home as infants, the monkeys undergo extensive training before being placed with a quadriplegic. Around the house, the monkeys help out by doing tasks including microwaving food, washing the quadriplegic's face, and opening drink bottles. They do not always do well in these situations as they often have their teeth removed when they are young for safety purposes. Scarlet macaws are large, spectacularly colored parrots. They have a distinct low squawk that can be heard at long distances. Before their decline in population, their distribution included much of Costa Rica. However, by the 1960s, scarlet macaws Macaws had been decreasing in numbers due to a combination of factors, particularly hunting, poaching, and the destruction of habitat through deforestation. 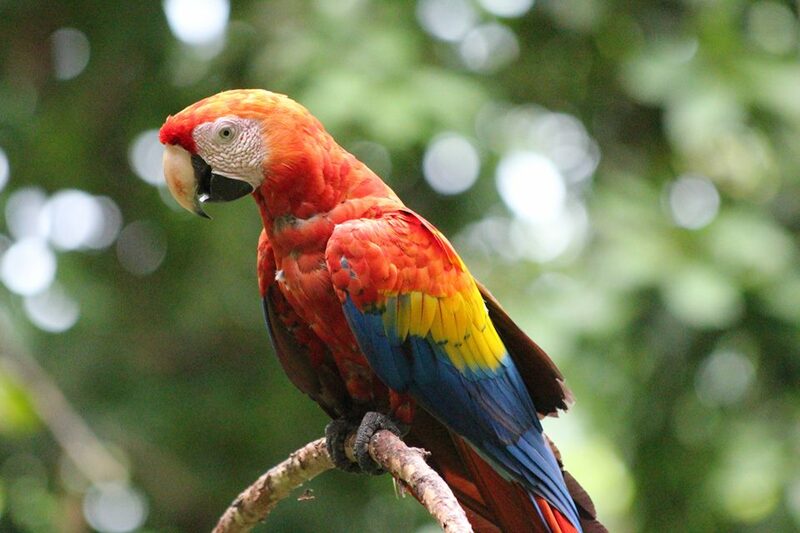 Further, the spraying of pesticides by companies cultivating and selling bananas for export played a significant role in decreasing scarlet macaw populations. This striking bird with its large colorful bill is known to some as the "thug of the jungle". Toucans are arboreal and live in small flocks. When they fly they rarely travel more than 300 feet at a time. This species is primarily a fruit-eater, but will also eat other small prey (insects and animals). The call of the Chestnut-mandibled Toucan is a yelping yo-YIP, a-yip, a-yip. It is given to maintain contact with the flock and travels in "follow-my-lead" style through the trees. Their piercing tones can be heard in the morning and at the evening roosts. It is illegal to take toucans or any other protected wild bird species from their nests. A mating pair stays together for the season and forage as parents. A male will feed his mate fruit and will only allow his mate to forage in "his" section of a fruiting tree. Often, a male will arrive first at a tree and before he finishes all the fruit, he leaves some for the female who finishes the fruit while he moves on to another tree. 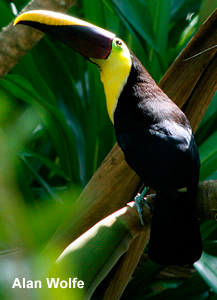 This strategy of dominating two trees at once allows them more food and most other birds will leave toucans alone. Home Range: 5 – 7 acres. They occur at a lower density than the three-toed sloth. 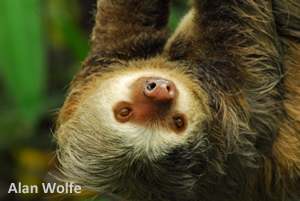 Sloths are unique in form and behavior and spend most of their time upside down. Their hair grows backwards from the belly and has a special grooved structure that encourages algae growth which gives the sloth a greenish tint which helps as camouflage. They forage on buds, flowers, twigs, fruit and occasionally eat insects, bird eggs or small vertebrates. Sloths have a many-chambered stomach which is almost a third of their body weight. They compensate for their large guts and low-energy diets by having relatively little muscle mass which is about 25%. They have the lowest and most variable body temperature of any mammal, between 77° to 96° F. Females greatly outnumber males in the wild and mate infrequently. The gestation period is 11.5 months. Newborns weigh about one pound and are not fully weaned until 9 months and often remain with their mother for up to two years. They grip onto their mother's fur with their tiny claws. The mother chews leaves and passes them to the young so that the bacterium necessary for digestion is transferred to the young. 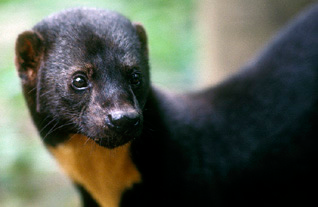 Tayras are arboreal and terrestrial. 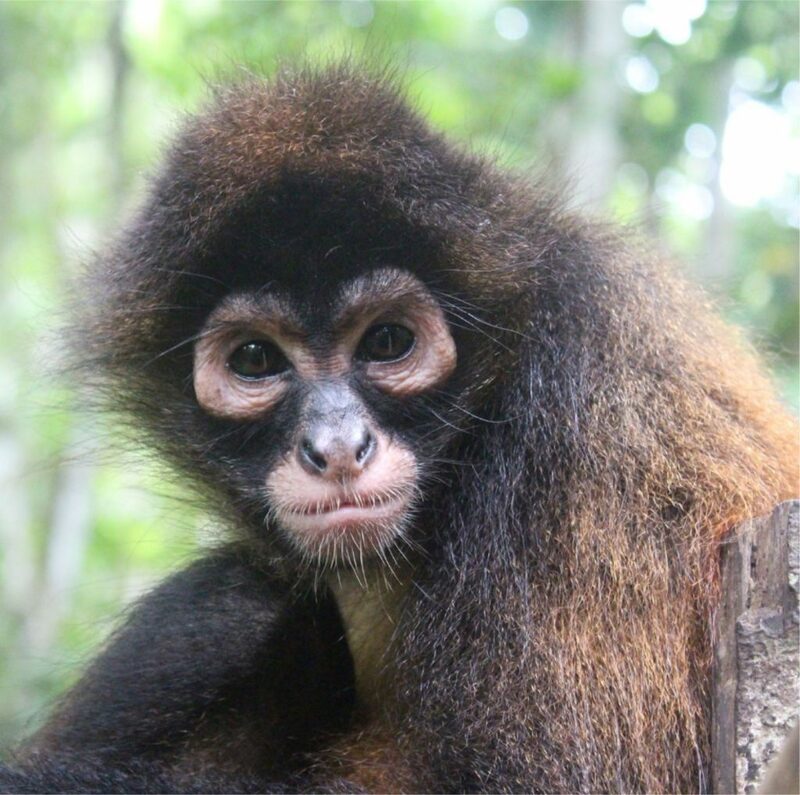 They are mostly dark with a very bushy tail, while Costa Rican Tayras can be totally black (this only found in Costa Rica and Panama). Tayras are active all day with peak activity in the early morning. Their diet consists mostly of fruit and small prey. They are excellent climbers but spend considerable time on the ground. Kinkajous are in the racoon family. These solitary animals are mostly nocturnal and spend their days in tree hollows. They live in both primary and secondary forests. Kinkajous have a prehensile tail and a very long tongue; the narrow long tongue lets them probe openings and flowers for insects. Kinkajous feed mostly on fruit, and figs from ficus trees are a favorite. Kinkajous are slow-moving animals with low metabolic rates, heart rates, and temperature. 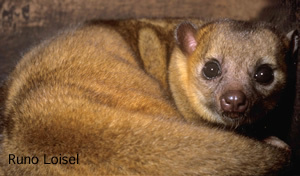 A myth exists in Columbia that if you hear a Kinkajou bark, a family member will die today. 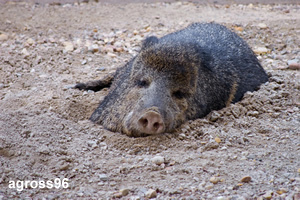 Peccaries look similar to pigs, but are smaller and are classified in the Tayassuldae family. They have longer, thinner legs and smaller hooves with four toes in front and three toes on each hind foot and the upper tusks (1.5 inches long) are pointed down. They have a powerful musk gland on top of the rump which they use to defend their territory by rubbing the oil glands against rocks, tree trunks and stumps. Their odor is always apparent, especially when they are excited. You may smell a peccary before you see it. Their fur is very coarse. This species is very vocal and classified into three categories: aggressive, submissive and alert. The main dietary components of this species are agaves and prickly pears. They are absolutely harmless unless attacked.